All Right, Ready to go? I'm Ready. Ready? Let's go. The Digivolutions is up and running! Digi-See? Digi-Hear? Digi-Know it was coming? Let me hear you say... DIGIMON! 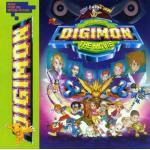 Digimon Digital Monsters, Digimon are the champions! Do the Digi-Dynamics Towards the Digi-Land! When your Digi-Past and Digi-Present collide! And now we'll meet in Digi-Pace. Digimon's making a Scene Their Kicking it up. Kick it up to the Big Screen. Attack from the Digital Master! Remember the Digi-Things I say! And Digis Save the Day.